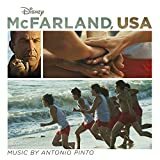 Accueil Produits Bande originale La bande originale de “McFarland, USA”. La bande originale de “McFarland, USA”. Sortie : 17 février 2015. 1. Juntos (Together) (par Juanes) – 3:18. 2. The Real McFarlands – 2:39. 3. Me and Baby Brother (par War) – 3:26. 4. Let’s Hit It Again – 1:54. 5. Lord’s Prayer – 3:48. 6. Watermelon Man (par Mongo Santamaria) – 2:26. 7. Barbie Bike – 1:45. 8. Flashlight (par Parliament) – 4:29. 9. Convoy to State – 2:05. 10. Whittier Blvd (par Thee Midniters) – 2:28. 12. This Ain’t Golf – 2:10. 13. That’s Not Danny Diaz – 7:52. 14. McFarland Theme – 2:43. 15. América (par Los Tigres Del Norte) – 3:02.